Posted by Sapphire. September 15th 2014. Camping is a great summer activity for you and your dog; however not all camping grounds allow pets. Those that do are a great option for animal lovers but there are still some things to think about before you camp. One quarter of families with dogs take their pet with them on trips so here are some things to consider so that you, your dog and other campers have a great trip. If your dog is used to using a travel cage then make sure it’s the right size so that your dog can settle comfortably on the journey and ensure they have access to water at all times. Be certain to bring your dog’s usual food and treats from home on the trip to make them feel comfortable and settled. It’s also worth bringing bottled water to prevent your dog drinking from rivers and streams during outings and potentially catching illnesses. Other essentials are dog toys, leads and your dog’s bed. Going to an unfamiliar place can be unsettling for pets so having familiar items from home can make the experience more enjoyable. As well as these essentials there are some extra items which are worth bringing to make the trip run smoothly. A sturdy object or ground ring is useful so that you can tie the dog to it while you are cooking or sleeping but you may also need a hammer or mallet to steady the object in the ground. A first aid kit for you and your dog is also a good safety measure; make sure it includes your vet’s details, bandages, antiseptic and flea or tick treatment. This is never a pleasant thought but definitely a necessary one on a camping trip. Bring plenty of bags and scoops to clean up after your dog and invest in a dog pack so your pet can carry its own waste until you reach the nearest bin. Also try and prevent your dog from ‘marking its territory’ near swimming areas, children, or food areas – not only is it unhygienic but also unpleasant for you and your fellow campers. 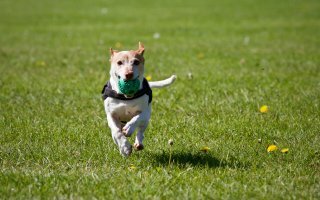 Make sure your dog is well trained and invest in some training sessions before you leave home – it will be worth it when you can prevent your dog from jumping all over other campers, running off and causing trouble. 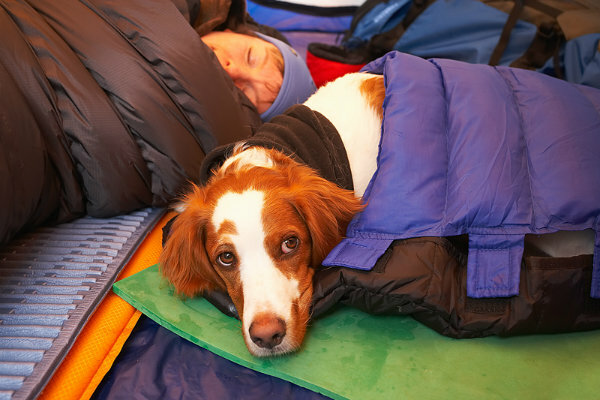 To help you while you’re camping, make sure you always have a lead on you and that your dog responds to your commands. A runaway dog is not fun to deal with in a huge open space but if your dog is well trained and you’re prepared then there’s no reason why camping with your canine can’t be great fun.